← Why is the Australian voice silent in writing – why can’t it be heard? Capturing history in something as simple as a book dedication. This week’s blog post is a little different as I won’t be talking about being a Writer, an Author or trying to sell my own books. Shock horror, I know! Instead I will be dabbling into another topic I love – old cookery books. 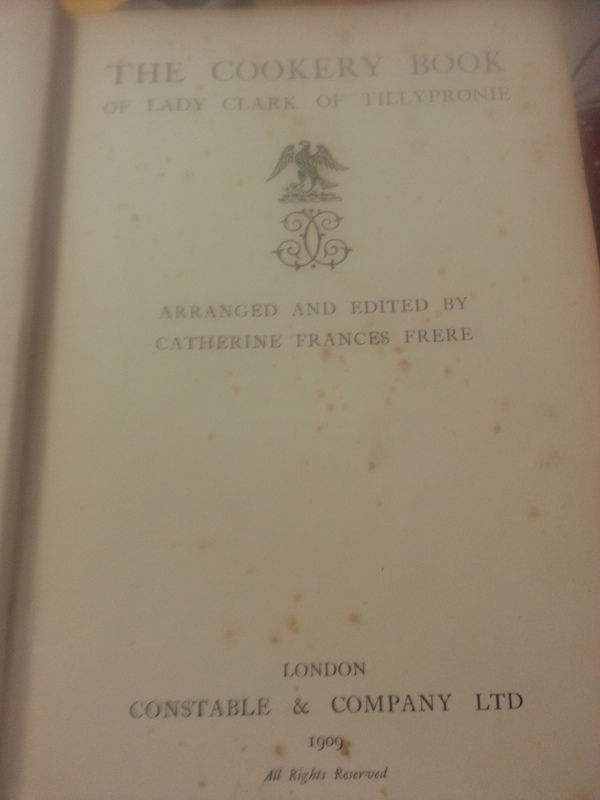 And one cookery book in particular because of its historical associations. 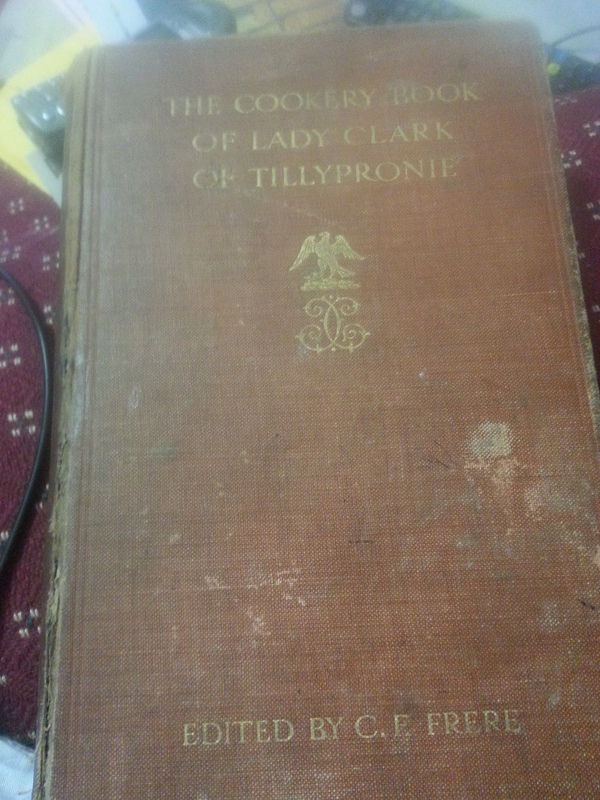 The book in question is this: The Cookery Book of Lady Clark of Tillypronie, pictured below. I bought this book via an online auction site a few years ago now. Why? Because I’m deeply in love with old cookery books and the older they are the better. Plus, for being an one hundred year old cookery book, it was priced at only sixty dollars and therefore within my miniscule book budget. It was old, about cooking and cheap. So, yes, I coveted it and wanted it and eventually bought it. Oh, and that’s Christmas 1909 by the way, not 2009. Say hello to my little friend Google. I of course put in this name ‘Gerald V. Wellesley’ and, to my amazement and delight, had a whole chapter of history open before me. And that is what this blog post is about! How a, possibly witty, inscription to one friend from another all those years ago could capture a piece in time that, from what I can Google is long gone and mostly forgotten. I really do hope you’re reading this on the edge of your seat and screaming “So who is he? !” and that you’ve not ruined the suspense by going and Googling him yourself. For he is, was, Lieutenant Colonel Gerald Wellesley, 7th Duke of Wellington. So yes a descendant of the chap at Waterloo. Wow! And he signed my book! And here I was thinking the Reginald Hill book I own, signed just before his death, was a pretty awesome treasure. After some research, I discovered he had been a diplomat, held many titles and prestigious awards and had indeed gone to Eton. So who were these old boys and how was he the father of their club? At first I searched for information simply on Eton and found a lot regarding that school and a lot of pros and cons (snobbery and distain) about it being an elite place for the top brass and those rolling in money. But then I realised this was the school not the club. The club came from Eton when people at actually attempted some good for the ‘lower classes’ of the time. It started with a Christian mission to assist boys from impoverished areas (like the West End of London) have a slightly better chance at life. The ‘Boys club’ was actually set up by former Eton students, Wellesley being one of the co-founders, as a branch of the Christian mission to help those from poorer areas have access to sporting facilities. Wellesley was the head of this club until after the first world war, where he handed the reigns over to Arthur Villiers, who I believe is more well known for being in charge of this club and other, similar, sporting facilities. 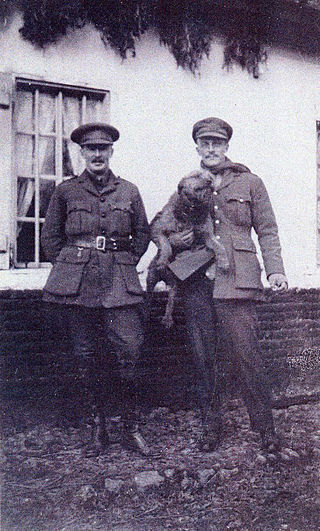 Here is a picture of the two of them together, thanks to Wikipedia. 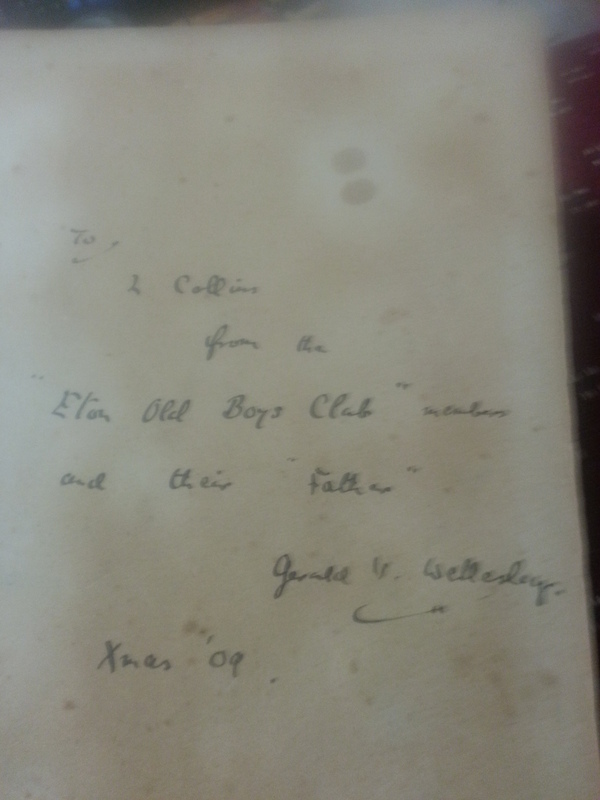 And that sadly is all I can find out about this book’s connection to the club and its founding members. I wish I knew more, I wish I knew how it ended up on an auction site in Australia with the seller seeming oblivious to its history… or possibly not thinking it that important. But to me it is a fascinating window into the past and one I would dearly love to find out some more about. Especially, who is this L Collins it is dedicated to, as it’s not a name that has appeared once in my searches. Are they a lady (as it’s a cookery book)? Are they a member of staff at the club? The mother or friend associated with the club? One reason I’m writing this blog post is in the vain hope someone who knows more about it all can shed some light on it. Especially as it is a part of history, and one that continues as we start to discuss the hand-written recipes in the back. The saddest part about the hand-written work is some of it was done in pencil and is now but a mere faded shadow and I wish I knew how to capture it before it is gone completely. One of the most well preserved recipes is shown below, well the title is. 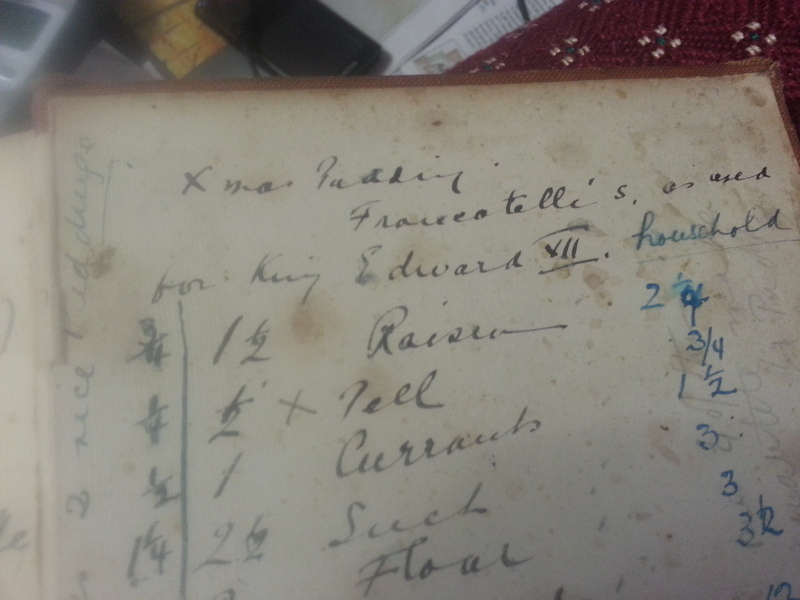 Even I can’t make it out clearly, but believe it reads: Xmas Pudding Francatelli’s, as used for King Edward VII household. Why I think that name reads Franactelli? Google, pure and simple. It started by me typing in what I thought it said, and this found me a PDF from the State Library of Western Australia website showing an old newspaper of real estate ads. I don’t know its age or true source, but in the first column, about half way down, was an advert for 88 Airway’s House and there was a Francatelli’s café. So I googled the name and discovered… a lot! The Royal English and Foreign Confectionery Book. Yes, going to have to give another wow here as these are exactly the sorts of cookery books that fascinate me. Especially as modern cooking seems more suited to TV reality shows than actual, decent, sustaining cooking. It is my passion for the old recipes where simple, whole foods (mostly local) were used to make magnificent feasts on little to no budget. Something modern day seems to have lost as it’s deemed as too fiddly, too expensive and too time consuming. Pah! So, my sixty dollar cookery book’s little window into history has opened further. Who wrote that recipe into the book? Was she the head cook of someone important? Whoever they were, and as nameless as they currently are, their memory lives on in my book. I mean, this book was published in 1909, Wellesley inscribed it in 1909, King Edward died in 1910… History happening here, in my cookery book and I’ve not even started cooking yet. Do you write inscriptions in books when gifting them to people? I do, and so has my family for a few generations now. How do I know? As the gift givers may be long gone, but their writing and words live on between the pages. Even family and friends lost within my own life time shine out at me when I open certain books. While their words live on, so do they. And I that is pretty much what this post is also about. How amazing it is to see the past still with us through a few quickly written notes of endearment on the inner cover of a book. To those who feel writing in a book is blaspheme – poo to you! 😉 Sorry, I’ve been reading Regency romances again. Seriously though, why are you so down on it? Yes there is a time and place for it and no that isn’t when my children scribble in books as all toddlers tend to do. And no this isn’t the same as when people underline all the swear words in the shared dictionaries at school or draw little smiley faces on inappropriate things in shared Biology text books. What I’m talking about here is capturing a moment in someone’s life centuries ago and therefore keeping them alive today. Due to my curiosity I’ve now learnt about the Eton Boys Club and a very clever chef from the 19th century. Think of this the next time you gift a book to someone important in your life. Think of what those words may or may not mean to those who read it in the years to come. Oh, and for those of you who haven’t guessed it yet, this post is also an online plea to anyone able to help me fill in some of the gaps to the history of this cookery book. Who was L Collins, how did the book arrive in Australia? I happily welcome any and all helpful information people can pass my way.